Okra is commonly known as Lady’s finger, Common okra, Okro, Gombo or Gumbo, Bindi Its origin is uncertain but it’s widespread in tropical, subtropical and warm temperate regions and is particularly popular in West Africa, Middle East, Caribbean, India, Phillipines, Thailand and Brazil. In the USA, Florida, Georgia and Texas are the leading producers. The species grown in West Africa is called Abelmoschus caillei and is popularly known as West African Okra. More than 6 million tonnes of okra are produced a year. The okra plant is a stout annual, erect herb, up to 4m tall with a well branched, stem covered with stiff hairs. The plant is mainly grown for its young immature fruits (pods) that are popular as a cooked or fried vegetable. Cooked okra exudes a gooey and slimy juice due to the presences of mucilage. Okra is a key ingredient in the thick piquant soup called gumbo and is popularly used in soups and stews. Okra’s flavour and texture are unique. It’s tastes is somewhere between that of eggplant and asparagus and it especially marries well with tomatoes, peppers and corn. 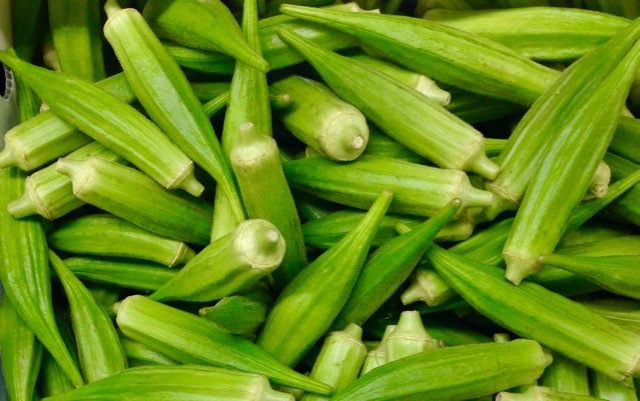 Okra is available in varying shades of green or white and in chunky or slender shapes with either ribbed or smooth surface. Varieties with ribbed pods are the most common. 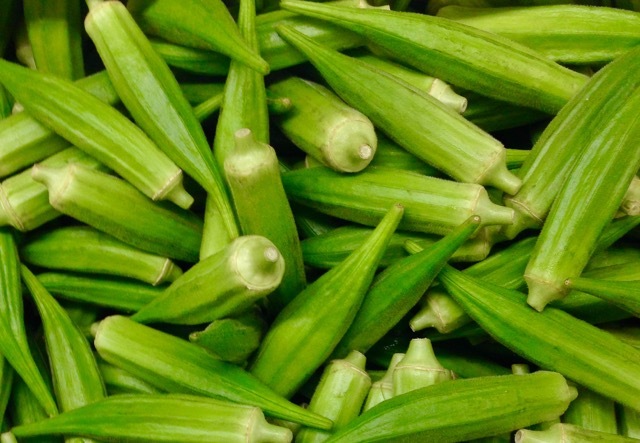 Okra is considered a delicacy in the American Deep South, particularly when breaded with corn meal and deep-fried. It’s an integral part of Creole dishes..
Several cafés and nationwide restaurant chains serve deep fried okra, typically with a side order of buttermilk sauce (or ranch) dressing. Since the entire plant is edible, young leaves may be cooked in a similar way to the greens of beets or dandelions or eaten raw in salads. In West Africa, okra usually boiled in water to make slimy soups and sauces. or fresh fruits (pods) can be pickled. Okra leaves can also be used as cattle feed. Not everyone finds the mucilaginous texture pleasing so keeping the pods intact, and brief cooking, for example stir-frying, help to reduce the sliminess. Cooking with acidic ingredients such as a few drops of lemon juice, tomatoes, or vinegar may also help. Alternatively, the pods can be sliced thinly and cooked for a long time so the mucilage dissolves, as in gumbo. The immature pods may be pickled. Okra is a popular health food due to its high fibre, vitamin C, and folate content. It is a good source of magnesium and potassium. Okra seeds may be roasted and ground to form a caffeine-free substitute for coffee. Compared to tomato and eggplant okra is particularly rich in calcium and ascorbic acid (vitamin C). Carbohydrates are present in okra, in form of mucilage. The mucilage is highly soluble in water and it becomes viscous and slimy. Small, young pods, no more than 3 inches long, are the most tender. As the vegetable matures, it becomes tough and fibrous. Choose crisp and fresh pods that snap crisply when broken in half. Avoid hard, brownish or blackened pods. Do not wash or trim okra until you’re ready to cook them because the mucilage easily dissolves in water and the pods will become slimy. Store okra in paper or plastic bags in he fridge crisper for no longer than three or four days. Okra became a popular vegetable in Japanese cuisine toward the end of the 19th century, served with soy sauce and katsuobushi as tempura and more recently as a nigiri sushi topping. Okra mucilage is used in confectionary. It’s suitable for medicinal and industrial applications e.g plasma replacement in blood volume expander. Leaves have been reportedly used as a poultice, emollient and sudorific. Stout annual, erect herb, up to 4m tall with a well branched, stem covered with stiff hairs Leaves simple, palmately lobed, arranged spirally, up to 2cm x 50cm and with 50cm long petiole, red tinged in colour. Fruit a cylindrical or pyramidical capsule 5-25 x 1-5 cm, 5-10 angled. I have never eaten pickled okra, but I can imagine what it tastes like! Best Regards to the boys! I love your tips on how to reduce the sliminess! Great post! Thank you so much. Have a lovely day!